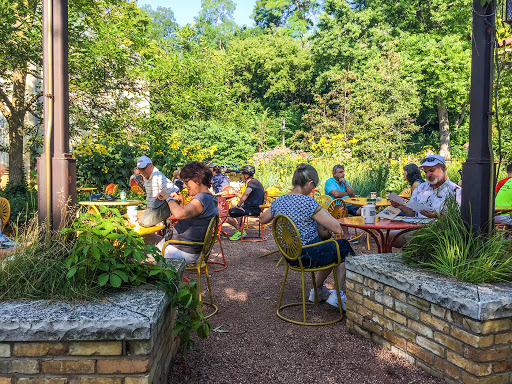 The mainline Oak Leaf Trail runs from the Ozaukee Interurban Trail at the Ozaukee County Line on the north side to Lakeshore State Park downtown where it meets The Hank Aaron State Trail. On the south side the mainline Oak Leaf Trail meanders along Lake Michigan through parkways to Grant Park in South Milwaukee. The length of the trail described here is paved with asphalt and there are minimal road crossings. 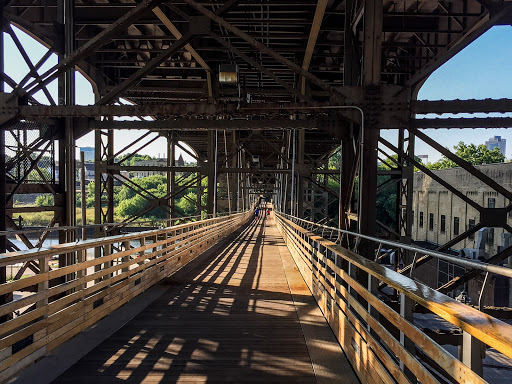 The Beerline Trail is a recent addition that weaves through parkways along the Milwaukee River from Riverwest to Brady Street. With a short ride east on Brady Street you can connect back to the Oak Leaf Trail at Lincoln Memorial Drive. 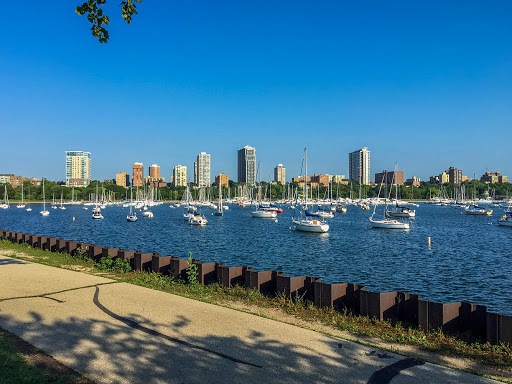 Taken together, there are many biking routes that can be put together into a morning of awesome bike riding along the Milwaukee River and the shores of Lake Michigan. 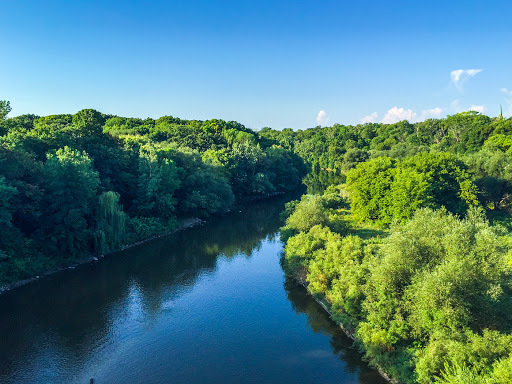 While you'll be biking through the heart of a major industrial urban center - you'll feel away from it all and surrounded by nature most of the way. If you're from Milwaukee then you won't have a problem navigating the Oak Leaf Trail. If you are are coming in from out of town then have a detailed map and beware: every paved trail in Milwaukee County is The Oak Leaf Trail. If you are traveling along the Oak Leaf Trail and cross an intersection with a sign pointing to another Oak Leaf Trail, don't worry - it's just another one of its many branches. The mainline trail is straight forward. 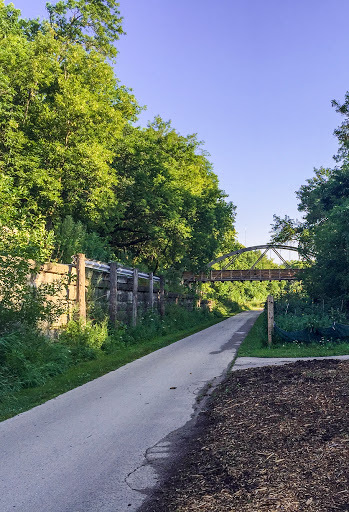 It follows a retired rail line from the Ozaukee County line into downtown Milwuakee. 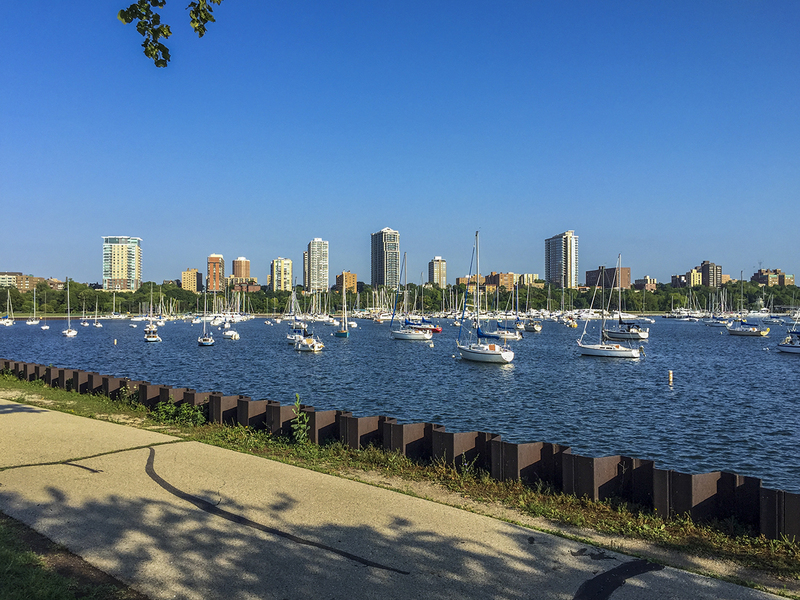 Then, on the South Side, beginning in Bay View, the mainline follows along the shore of Lake Michigan to Grant Park in South Milwaukee. 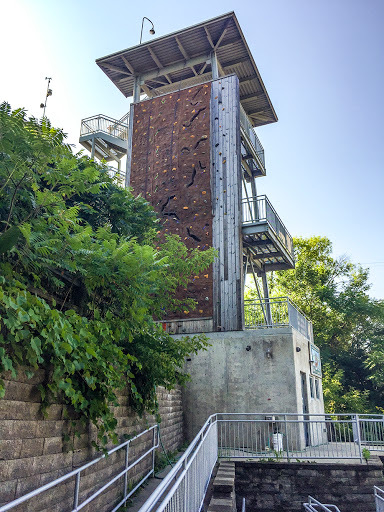 For a great ride on the North Side begin in Estabrook Park at the coordinates linked in the 'Directions' section below. Then, head south along the forested banks of the Milwaukee River. After crossing under Locust Street, veer off on a spur trail that leads up to the athletic grounds of a high school. Then cross the Locust Street Bridge to the Riverwest Neighborhood and hook up with the Beerline Trail in Humboldt Park. The Beerline Trail is a new trail funded in part by the National Park Service. This trail is abundant with amenities and artwork. Shaded and meandering downhill along the Milwaukee River it ends mysteriously at the north end of the Milwaukee Riverwalk near the boathouse. Bikes are not allowed on the Riverwalk, as was pointed out to me. So, find your way back over to the Beerline trail which is a sidewalk on the less scenic northwest side of street. From there you can get onto a spur called The Oak Leaf Trail - but beware ... this is not the Oak Leaf mainline trail and far from it. This short spur brings riders to the north side of the Marsupial Bridge. 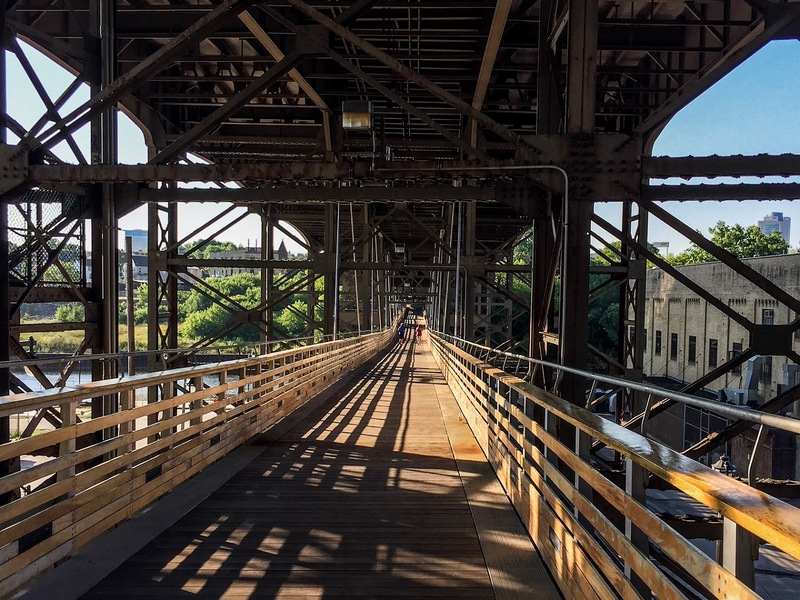 A rare feat of city planning and coordination - the Marsupial Bridge is a wood decked pedestrian bridge that is rigged beneath the Holton Street Viaduct. There's a small partially disguised path directly across from the Marsupial Bridge that leads up to Brady Street. On Brady Street you'll find an old world kind of city streetscape. Church steeples, bars, cream city brick, and shoppes galore. Several of my favorite coffee shops in Milwaukee are found on Brady including Brewed Awakenings and Rachambo's. 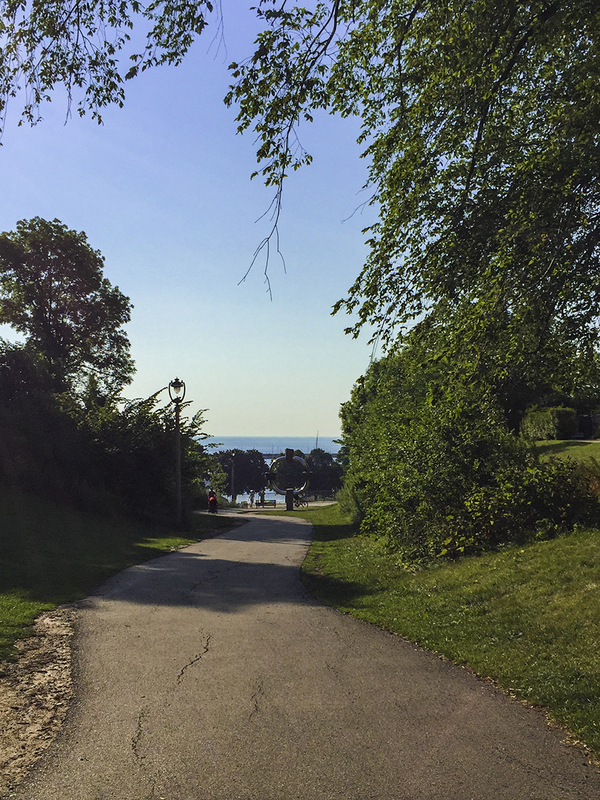 At the east end of Brady Street there is a switchback trail that descends the lake bluff with commanding views of Lake Michigan. (If you guessed that this trail was named Oak Leaf you win). Once down the bluff, the straight and wide paved Oak Leaf trail mainline is nestled into the wooded lakefront bluffs. 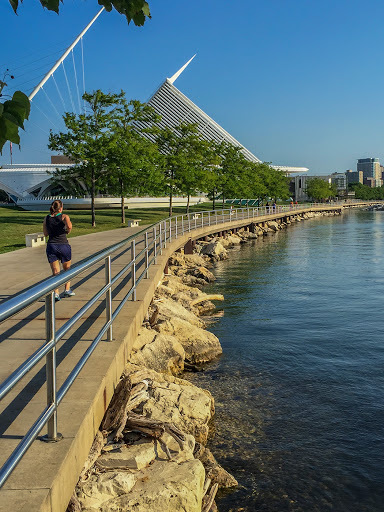 The trail crosses Lincoln Memorial Drive at the Milwaukee Art Museum where I diverted into the series of parks that greens the downtown lakefront. 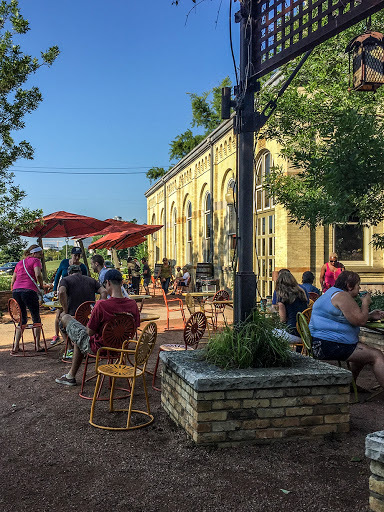 I found my way along 15 different Oak Leaf Trails to a Collectivo Coffee House that is sited in a historic pump house across from the marina. This is a great place to stop on a beautiful day - a popular Milwaukee destination. There is a very awkward connection from Collectivo back to the Oak Leaf mainline by riding up the lake bluff just to ride back down it on a spur. Unfortunately - I haven't found a way around this to date. 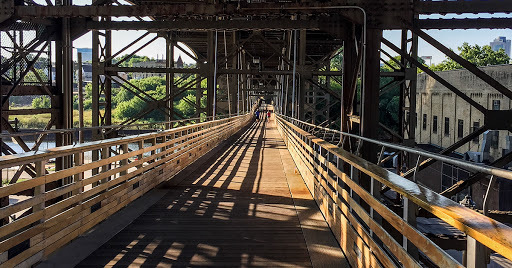 Once back on the mainline trail, I whizzed along under street bridges and along the Milwaukee River opposite the Beerline Trail back up to Esteabrook Park. The route I just described is a great morning constitutional. But, it might be somewhat difficult for novice or nervous riders. These trails are congested with joggers and other bikers. If you are looking for a quieter ride in the park - I enthusiastically recommend the South Side Oak Leaf mainline from Sheridan Park to Grant Park. I'll cover that ride in a separate article. But, for an unbeatable ride along both riverfront and lakefront - the Oak Leaf trail is your best bet in Milwaukee and Wisconsin. Photos, GPS recorded trail map, links, and video in the sections below. Milwaukee River at Locust Street. Oak Leaf Trail on the left side, Beerline on the right side.